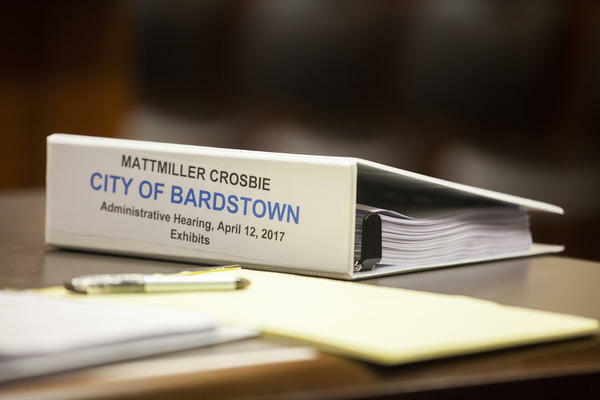 Bardstown Mayor John Royalty was removed from office Thursday by a unanimous vote of the Bardstown City Council. Bardstown Mayor John Royalty takes the stand as the final witness Thursday in the hearing that could lead to his removal. Bardstown City Councilman John Kelley, standing in the jury box of the Nelson County Justice Center, reads a motion calling for the removal of Bardstown Mayor John Royalty Thursday evening. The council voted to remove Royalty on three charges of official misconduct. A binder filled with exhibits used in the removal hearing of Bardstown Mayor John Royalty sits on a table in a courtroom of the Nelson County Justice Center. The exhibits were collected during a three-month investigation commissioned by the Bardstown City Council. • Was there substantial evidence the mayor used city personnel and resources to access Councilwoman Kecia Copeland’s private emails without executive authority to do so? If so, was there substantial evidence that it violated the law? • Did the mayor disseminate private email communications to a third party in violation of Copeland’s privacy rights, without executive authority to do so, and was such action misconduct? • Did the mayor order a city employee to lie to the City Council to gain access to their iPads, and was doing so outside his authority as mayor and was there substantial evidence that it violated the law? They voted yes on all three counts after two hours and fifteen minutes of deliberation. 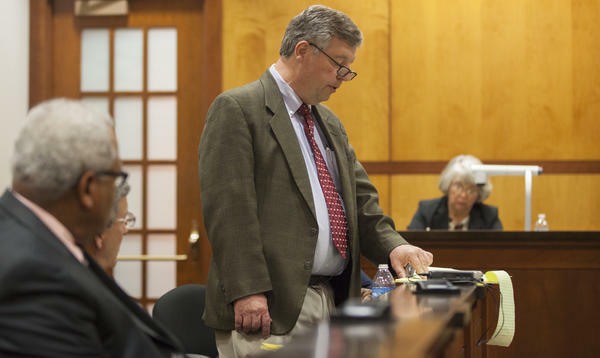 Royalty took the stand in his own defense Thursday, testifying for more than two hours in which he portrayed his actions late last year as an attempt to preserve public documents and acting under his executive authority. Royalty offered several explanations for his actions involving two fire incident reports and accessing Copeland’s personal emails after he obtained her iPad under alleged false pretenses. Royalty said he asked Bardstown Fire Department Capt. Todd Spalding to print out two fire incident reports because he had heard “a general community conspiracy theory” that she had set the fires herself, and was trying to put those rumors to rest. “I said (the fire) was fully investigated and nothing is being covered up,” Royalty said. He said he had copied those incident reports and passed them out to others in the community at a series of regular meetings he conducted. The two incident reports showed up in a series of packets left anonymously at a Nov. 1 council meeting, and Royalty’s attorney, Jason Floyd, said any person who Royalty had passed out copies to could have put them in the packets. As for accessing Copeland’s emails through her city-issued iPad, Royalty said he did not instruct a city worker to lie about needing updates. But City IT Supervisor Brandon Brewer testified that while Royalty did not explicitly say “lie,” the mayor directed him to send a misleading email to all council members saying an update was required. “There was no lie. Not in my opinion,” Royalty said. On the stand, Royalty maintained an update was required, while simultaneously testifying he was not technologically savvy. At one point, he denied sending an email with a reminder for council members to turn in their iPads because the last line of the message was in bold print. Royalty said he did not know how to bold a line, and said his former executive assistant, Kathy Graham, must have written the email. Royalty said the false pretense of the message was necessary because he was concerned if council members knew he wanted them scanned for improper personal use, they might destroy some documents. “I don’t want open records material to be destroyed,” he said. Royalty and his attorneys asserted the city’s policies on releasing public documents had been lax in the past, and they were trying to change the “culture” to one more proper. Royalty’s attorneys also asserted that some of Copeland’s emails should be considered public records because they could be accessed by the iPad and the same account was used for official business, but exempt from disclosure under the privacy exemption. “These iPads belong to the government, they belong to the people of Bardstown,” Floyd said. 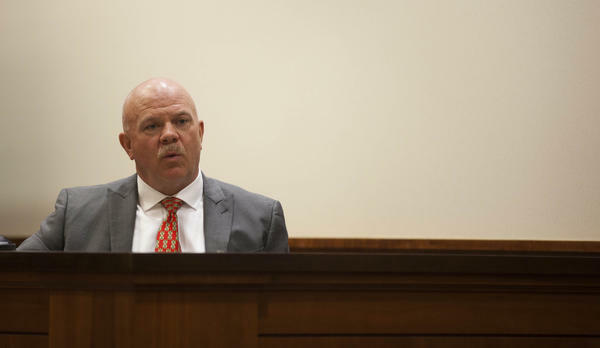 In his closing remarks, Scott Crosbie, the Lexington lawyer who conducted the three-month investigation and presented them at the removal hearing, lined the courtroom walls with large sheets of paper outlining the allegations. In his closing, Floyd maintained the investigation of the mayor was “one-sided” and Royalty was not given adequate time to prepare his defense. He urged the council to base their decisions on the Constitution and due process, not on personal disagreements.